I know I've been saying I'm so busy on the website (news of which will wing your way tomorrow!) and yet there are many posts for my book list recently, but they are from when we had just moved and had no internet, hadn't unpacked any tools or materials and so couldn't be getting on with much work! David Almond is a fabulous writer and even though I have become the woman who gets children's books out of the library, I care not. Since discovering him through the ravings of our PGCE tutor I have been enchanted and read Skellig with just about every year 7 class I taught! One of my favourite schemes of work at my old school was devised with an Art teacher and we combined forces for some cross curricular Skellig action; it was ace and the students produced some brilliant work! Many of Almond's stories are set in North Northumberland and I was struck with a memory of one of them driving along the road and thought I'd have a wee look in the library for any more. 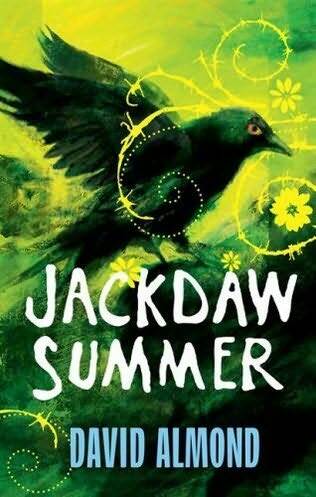 Jackdaw Summer is another brilliant story and, yes, I read it surrounded by many jackdaws flying around the trees and chimney pots and felt very glad that we had caged and capped our chimney pots or by now we would have a very noisy wall!